Today’s health care consumers — baby boomers in particular — are hungry for reliable health content, and more than ever they are using the web to educate themselves. The Pew Research Center reports that nearly 80 percent of internet users go online for answers to health questions. Perhaps more surprising is the rising role social media plays in consumer health education. According to PwC’s Health Research Institute (HRI), 42 percent of consumers have used social media to access health-related consumer reviews (e.g., specific treatment therapies or physician reviews), and 20 percent have joined a health forum or community seeking health content. Younger consumers in particular tend to trust social media as a credible source of information — 90 percent of individuals age 18 to 24 would engage in health activities or trust health information found via social media. Consumers also are demanding tools to help them take charge of their own health care decisions. Currently, more than 40,000 health-related apps are marketed to consumers — covering everything from diet counters to smartphone-enabled blood-pressure monitors and glucometers. This change in consumer behavior represents a huge opportunity for fast-moving hospitals to become content creators and provide an alternative to Google search, Everyday Health, and any of the thousands of health-centered sites and apps available today. Let’s take a look at which hospitals are moving fast, launching marketing news portals, community sites, videos and mobile apps to satisfy their customers’ appetite for health content. The Cleveland Clinic’s Health Hub is a one-stop shop for health tips and news, videos, physician blogs, expert Q&As and live online chats — and has been popular since its official launch on May 1. The site drew about 100,000 visitors in August and was expected to surpass that figure in September, said Scott Linabarger, the clinic’s director of digital marketing. All of the health content is written or approved by the hospital’s doctors and nurses, and many of the health articles feature Cleveland Clinic providers who are recognized experts in their fields. The site is fairly unique in the hospital arena and is being watched closely by industry experts. What about patients looking for more in-depth knowledge about their particular condition? Some creative hospitals are using video to offer a richer perspective. 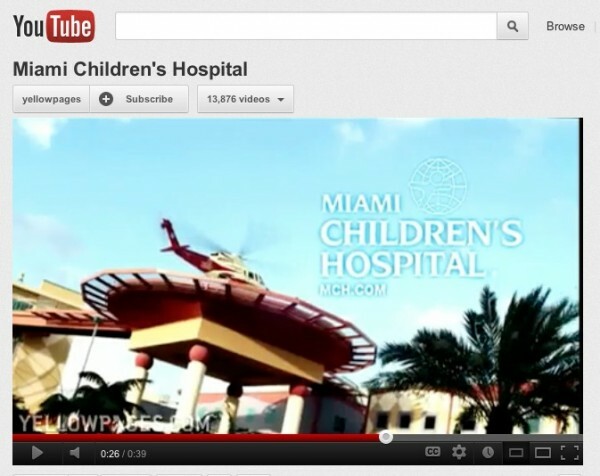 Miami Children’s Hospital launched a YouTube channel to spotlight complex surgeries routinely performed on infants and children with congenital heart defects. While the videos are graphic, each has generated tens of thousands of views. The video series does far more to boost the hospital’s reputation as a leader in pediatric surgery than any list of awards or quality indicators. And it appeals directly to the parents who would love to take the child’s place on the operating table by easing their anxiety. A big part of any hospital’s reputation — and the patient experience — is access to convenient care. Several hospitals have launched mobile applications that offer directions and parking information, tools to book appointments and emergency room wait times. 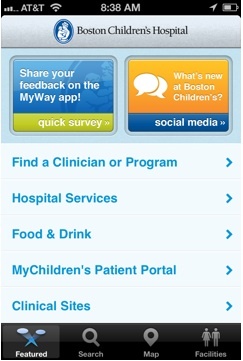 In April, Children’s Hospital in Boston combined most of those features and more with its MyWay app, designed to make visiting a huge urban hospital less daunting for local and out-of-state families alike. It helps patients navigate the hospital and satellite locations, find local restaurants and hotels, and even locate activities to entertain siblings during a child’s hospital stay. Want to learn more about health content marketing? Join Ahava Leibtag, Scott Linabarger and other healthcare marketers at Content Marketing Health Summit on November 7 – 8 in Cleveland, Ohio.